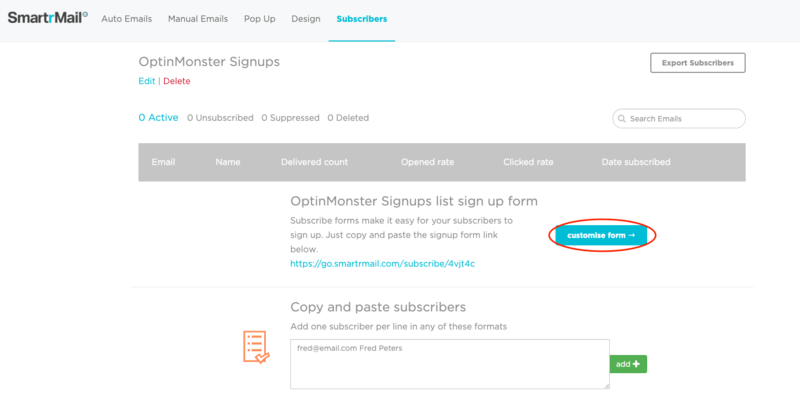 Within your Subscribers tab in SmartrMail, select which list you want people who sign up through your OptinMonster form to be added to. Once you have clicked on the list (or created a new list), click on the blue 'customise form' button. At the bottom of the customise form page, you'll find embedded HTML code to copy. Copy this for later use. In your OptinMonster account, select which one of your current campaigns you want to have send signups to your SmartrMail account. If you don't have any campaigns yet, you'll need to create one. Once you're in the campaign builder, click on the "Integrations" tab in the top menu bar. This will then give you the option of adding a new integration by clicking on the "+ Add New Integration" button. 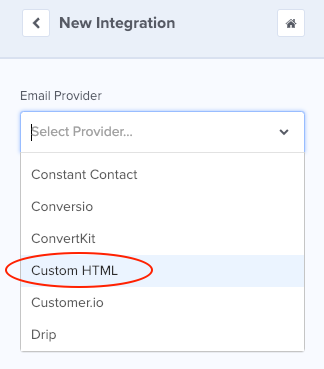 From the drop down list that appears, select the "Custom HTML" option. A text field will now have appeared. Paste the code you copied in step 1 into this field so that it resembles the image below. If you want, you can add CSS styling to your form to change its appearance. How that you've successfully added the code, you just need to save your OptinMonster campaign and set it live. If you need any further assistance, feel free to reach out to our support team. If you want to include fields for people to add their first and/or last names, you simply need to check the 'show' checkbox (and 'require' if you want to require people field out these fields) in the customise form page from step 1. You will need to click on the save button as this will update the HTML code you'll need to copy and paste into OptinMonster.